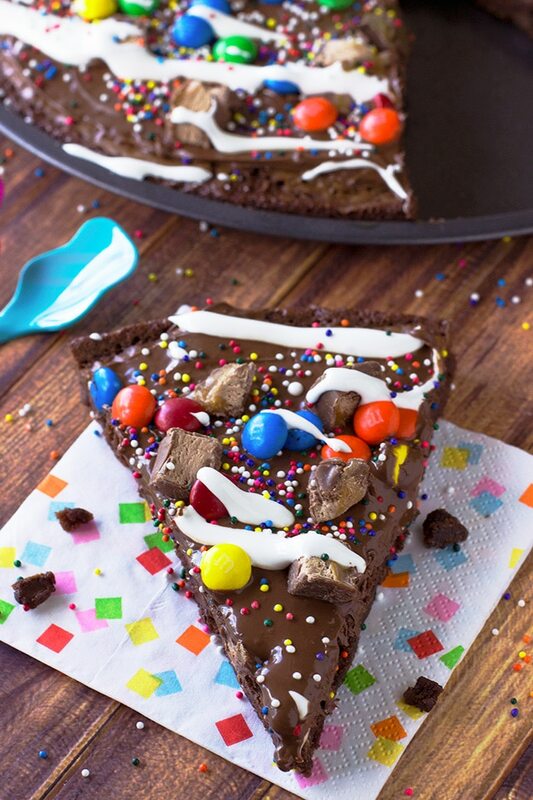 A fudgy brownie dessert pizza topped with Nutella, M&M’s, mini candy bars, SPRINKLES and drizzled with marshmallow creme. It’s a dessert that will put a smile on everyone’s face! If you have been following my blog this whole summer, you have noticed that I have been teaming up with Nutella® to share things that make me happy like my homemade Peanut Butter Cookies, Chocolate Oreo Cupcakes,the delicious Strawberry Upside Down Cake, the no ice cream machine needed Homemade Vanilla Ice Cream, my Dad & I’s favorite Chocolate Nutella Cookies, our families Banana Bread recipe and lastly,but definitely not least is this amazing Brownie Dessert Pizza which really puts a smile on my face and makes me super happy! Can you believe that this was my first time ever making a brownie pizza!?! Crazy right, I have been missing out! But it was fun sharing my passion and excitement from baking something new with my friend. After we baked the brownie pizza and let it cool. We spread a generous amount, like the whole jar of Nutella on top of the pizza and then it was the fun part of sprinkling the top with our favorite candies and of course a ton of SPRINKLES! Preheat oven to 350F degrees. Spray a 13-inch pizza pan with non-stick cooking spray. Set aside. Prepare brownie mix as directed on the back of the brownie mix box. Stir chocolate chips into brownie mix. Evenly, pour brownie mix into prepared pizza pan. Bake for 25 minutes or until a toothpick inserted in the center comes out clean. Let cool completly. 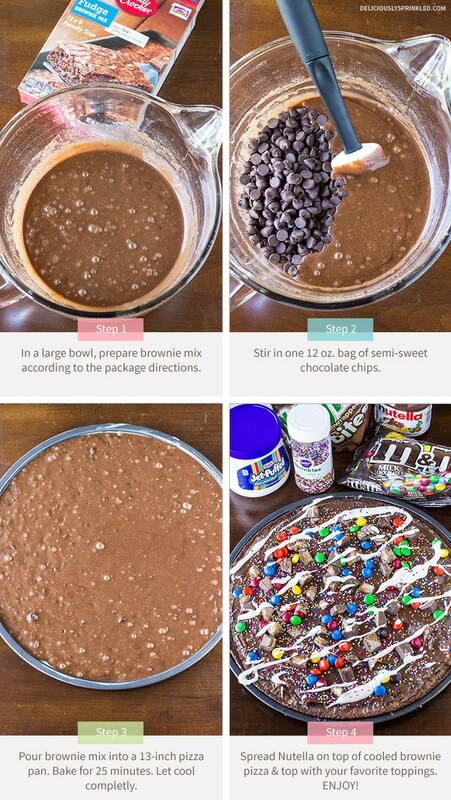 Once cooled, top with Nutella and sprinkle your favorite candy toppings on top of the Nutella. Use a pizza cutter to cut into 8-10 slices and enjoy! * Store covered at room temperature or in the refrigerator for up to one week. Me & My Best Friend Baked This Yesterday! Loved It! It Was Amazing, Fast, and Easy! ???????????????? Love This! Me & My Best Friend, Melanie, Are Definitely Making This Next Week! Buying Everything This Weekend. Love This Recipe ???? Love how festive this is! Pinned! This looks incredible! Such a fun dessert! 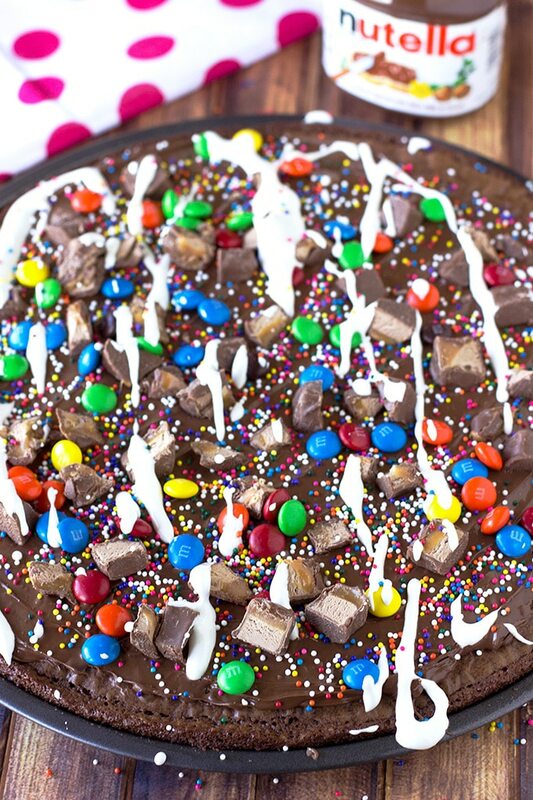 This brownie pizza is a beautiful sight! Wow! My kids would be all over this – and such a happy dessert! How much fun is this?!? I bet this would be a huge hit at a kids party!! This has so many of my favorite things!!! This is so fun looking! I’ve never made a brownie pizza before either, but if I do I will certainly cover it in Nutella! Pinned! 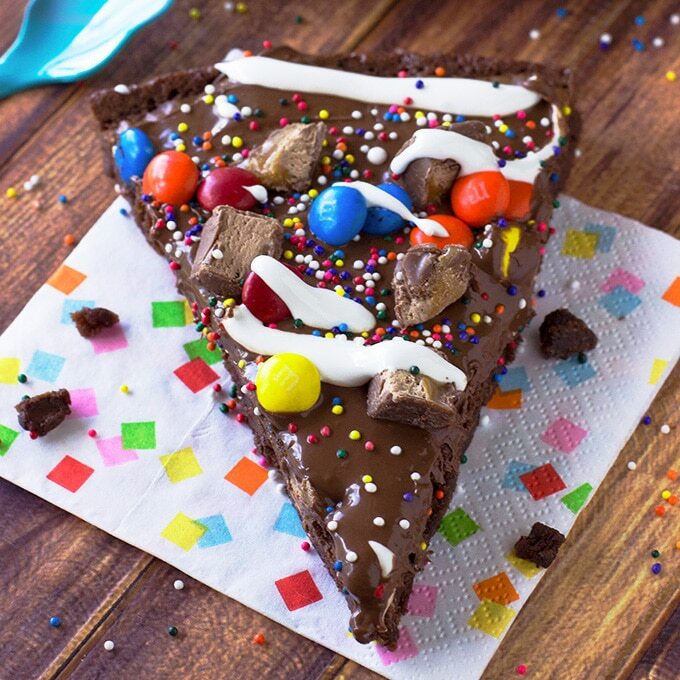 This dessert pizza totally puts a smile on my face. Mmm, Nutella! A chocolate lovers dream! I like that it is quick to make, tasty, and very attractive.